For accessing particular TiVo parts, you must open the TiVo. This is not a hard job at all, but some people have a hard time doing it anyway. 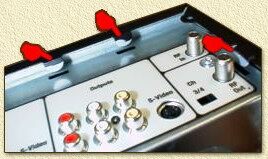 On this page you read how to open the TiVo and what parts you can find inside. Note: opening your TiVo will void waranty! Before you start, a reminder. You should realize that you are about to void warranty! Also be very carefull: the powersupply inside the TiVo is NOT shielded. Since this is a switching powersupply, high voltages might hurt you, so keep away from the powersupply. Even better:: ALWAYS REMOVE THE POWERCORD, so the TiVo is not powered in any way! Read the general disclaimer as well! At the back of the TiVo you will find 3 screws. You will need a Torex-10 to remove these screws. For those of you living in Europe: check Conrad - they have a large collection of cheap bit's including the Torex-10. Once you removed the 3 screws, you need to shift the top part (black) of the Tivo to the back. Note: It is possible that it will not do this by itself and you might need to apply a bit more force to it. The clips indicated in the image above (Note: the TiVo is placed upside down for this picture) might hold back the "hood" a bit.